The stadium's street address has been 1265 Lombardi Avenue since August 1968, when Highland Avenue was renamed in honor of former head coach Vince Lombardi. It sits on a block bounded by Lombardi Avenue (north); Oneida Street (east); Stadium Drive and Valley View Road (south); and Ridge Road (west). The playing field at the stadium has a conventional north-south alignment, at an elevation of 640 feet (195 m) above sea level. Since 1925, the Packers had played at 25,000-seat City Stadium, located behind Green Bay East High School. However, by the 1950s, it was considered inadequate for the times. It was built almost entirely of wood, and East High's locker room facilities were considered inadequate even in the 1920s; visiting teams often dressed at their hotel. Besides the school's location which limited any expansion of the seating southward, its placement along the East River meant seating expansion on the north and east sides of the stadium was also impossible. 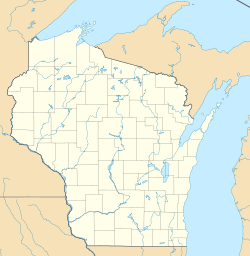 Officials in Milwaukee, 120 miles (190 km) to the south, where the Packers had played part of their schedule since 1933, knew that City Stadium was less than ideal as an NFL venue. They built Milwaukee County Stadium in 1953 in hopes of luring the Packers there full-time. As originally built, County Stadium was double the size of City Stadium. Soon after County Stadium opened, the other NFL owners threatened to force the Packers to move to Milwaukee unless they built a new stadium. In August 1955, the Packers announced plans for a new stadium in Green Bay, with a seating capacity of 32,000. In April 1956, Green Bay voters responded by approving (70.3%) a bond issue to finance the new stadium. The original cost in 1957 was $960,000 (paid off in 1978) and its seating capacity was 32,500. The renovation project is expected to create approximately 1,500 jobs and pay more than $60 million in wages. [needs update] Team president and CEO Mark Murphy said 95% of spending on the project will be done in Wisconsin and 69% in northeastern Wisconsin. The Green Bay Packers Hall of Fame is on the first level of the Atrium. The Hall of Fame is an independent, charitable association that promotes the history of the Green Bay Packers. Since 1970, 157 Packers have been inducted into the Hall, which attracts over 170,000 visitors annually. On August 20, 2015, the Green Bay Packers presented the master plan for the Titletown District, an area that will be constructed on approximately 34 acres of land just west of Lambeau Field. Titletown will consist of three tenants including Lodge Kohler, a hotel built and managed by the Kohler Company; a Bellin Health Sports Medicine Clinic; and Hinterland Restaurant and Brewery. Development on the remaining 16 acres calls for commercial, retail, and residential elements. Completion is scheduled for Fall, 2017. The Denver Broncos (0-4) are the only NFL team that has never won a regular season game at Lambeau Field. No team has an undefeated record at Lambeau Field. The last remaining team with an undefeated record, the Houston Texans, was beaten by the Packers in Week 13 of the 2016 NFL season. On November 7, 2000, two months after Brown County voters approved a sales tax to fund Lambeau Field's renovation, a second referendum was presented to the same Brown County voters. This referendum asked whether naming rights to the renovated stadium should be sold in order to retire earlier the 0.5% sales tax created to cover construction costs. The referendum passed 53%-47%, the exact percentage by which voters approved the sales tax. The Packers have sold naming rights to the eight entrance gates. From the north going clockwise, they are: Bellin Health (north gate), Miller Brewing (atrium gate), American Family Insurance (northeast gate at parking lot level), the Oneida Tribe of Indians of Wisconsin (east gate on elevated plaza facing Oneida Street), Shopko (south gate), Mills Fleet Farm stores (southwest gate), Associated Bank (west gate and private box entrance), and Kwik Trip (northwest gate). Verizon was the previous sponsor of the northwest gate (2003-2017). Miller Brewing is also a sponsor of the atrium, and has a section in one end zone called the "Miller Lite End Zone", giving away tickets in that area with various beer promotions. The stadium's nickname was spawned by the Ice Bowl between the Packers and the Dallas Cowboys, played on December 31, 1967. The game was played in temperatures of −15 °F (−26 °C) with sharp winds. Journalist Tex Maule associated Lambeau Field with the term tundra in his article summarizing the game in Sports Illustrated. The underground heating and drainage system was redone in 1997, with a system of pipes filled with a solution including antifreeze replacing the electric coils. After the 2006 season, the surface, heating, and drainage system was replaced. A new grass surface was installed, using the Desso GrassMaster system, which has synthetic fibers woven into the traditional Kentucky bluegrass sod. Even the new video boards, installed in 2004, have been influenced by the field's nickname, being called "Tundra Vision". These video displays measure more than 25 feet (7.6 m) high by 46 feet (14 m) wide. An artificial lighting system, based on technology used in Dutch rose-growing greenhouses, was tested in 2010 and purchased for use in the 2011 season. It operates 24 hours a day from October to early December to extend the growing season for the field's grass. The system is also used in some soccer stadiums where shade from stands and partial roofs are a problem for the turf, not the cold and short growing season found in Green Bay. Lambeau Field has frequently given a significant postseason home-field advantage for the Packers. Playoff games at Lambeau Field typically feature cold Wisconsin winters. The most famous example is the aforementioned Ice Bowl. More recently, in the 1997 NFL playoffs both the San Francisco 49ers in the divisional playoffs and the Carolina Panthers in the NFC Championship Game struggled to adapt to the muddy and the cold conditions respectively. The temperatures during the 2007 NFC Championship Game (in which the Packers lost in OT, 23–20, to the New York Giants) reached as low as −4 °F (−20 °C), with a wind chill of −24 °F (−31 °C). 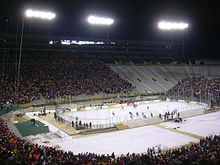 From its opening in 1957 until January 2003, when they fell 27–7 to the Atlanta Falcons, the Packers had never lost a postseason game at Lambeau Field. However, the Packers hosted just one postseason game (in the ad-hoc round-of-16 in the strike-shortened 1982 season) during a lean stretch of 27 years between the Ice Bowl of 1967 and a wild-card game in December 1994. Although the Packers have won only five of their last ten playoff games at Lambeau Field, their overall home post-season record is a respectable 16–5. The stadium has hosted five championship contests: three NFL title games in 1961, 1965 and 1967 (the "Ice Bowl"); two NFC championships after the 1996 and 2007 seasons. 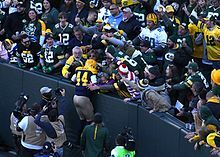 James Starks doing the "Lambeau Leap"
The NFL Network countdown program, NFL Top 10, named the Lambeau Leap the 3rd greatest touchdown celebration of all time. In 2016, Lambeau Field hosted the Wisconsin Badgers vs. LSU Tigers in the 2nd of a two-game series which started in 2014, where the game was in Houston at NRG Stadium. The Badgers won in what was called a "Historic upset" by ESPN and Yahoo! Sports, as the unranked Badgers defeated the #5 ranked Tigers 16-14. In 2004 a snowmobile racing event was held in the parking lot due to a lack of snow. In 2005 the snowmobile racing event took place over the grass, with the right amount of snow cover. 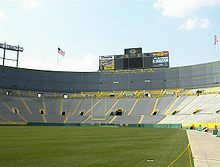 Due to the small size of the surrounding population, not many concerts are held at Lambeau Field because the primary use of the stadium is football. 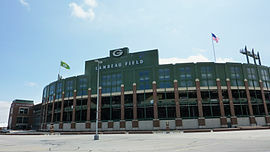 The Lambeau Field lease between the city of Green Bay and the Packers allows for one non-football event a month between February and June, with the Packers having veto power. ^ "Packers.com | Suites". Green Bay Packers, Inc. Archived from the original on October 17, 2013. Retrieved October 17, 2013. ^ a b "2017 Green Bay Packers Media Guide" (PDF). Green Bay Packers. 2017. Retrieved August 12, 2017. ^ "It's official, Lambeau Field Packers' home". Chicago Tribune. Associated Press. August 5, 1965. p. 4, section 3. ^ Greene, Bob (September 4, 1970). "Lombardi legend lives on in stories". Owosso Argus-Press. Owosso, Michigan. Associated Press. p. 10. ^ Spofford, Mike (July 29, 2013). "South End Zone Expansion Near Completion". Green Bay Packers. Archived from the original on September 2, 2013. Retrieved July 29, 2013. ^ "Packers.com | Stadium Info - History". Archived from the original on May 8, 2017. Retrieved May 2, 2017. ^ "Green Bay says yes to new stadium". Chicago Daily Tribune. April 4, 1956. p. 3, part 4. ^ Hollow, Cooper (September 29, 1957). "Packers open stadium, pro race against Bears today". Chicago Sunday Tribune. p. 3, sec. 2. ^ Hollow, Cooper (September 30, 1957). "Packers upset Bears, 21-17; Cards win". Chicago Daily Tribune. p. 1, sec. 4. ^ Miston, William (September 30, 2015). "After 15 years, Brown County Lambeau Field sales tax expires tonight". WLUK-TV, Green Bay. Retrieved December 7, 2015. ^ "Fans help shovel Lambeau Field before Packers/Vikings game Saturday". FOX6Now.com. February 22, 2016. Retrieved May 2, 2017. 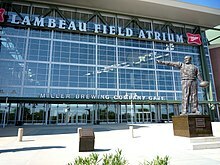 ^ "Packers plan $140 million Lambeau atrium upgrade". Retrieved May 2, 2017. ^ "Packers.com | Lambeau Field Atrium". Retrieved May 2, 2017. ^ Danilov, Victor J. (January 1, 1997). Hall of Fame Museums: A Reference Guide. Greenwood Publishing Group. ISBN 9780313300004. ^ "Titletown District" Archived November 8, 2015, at the Wayback Machine. Packers.com. Retrieved December 12, 2015. ^ a b Walker, Don (November 8, 2000). "Packers to Start Shopping Lambeau Name Around". The Milwaukee Journal Sentinel. Archived from the original on February 27, 2009. Retrieved August 9, 2013. ^ Maule, Tex (January 8, 1968). "The old pro goes in for six". Sports Illustrated. p. 10. ^ Nickel, Lori (June 2, 2008). "Grass is greener: Lambeau surface bounces back". Milwaukee Journal Sentinel. Archived from the original on October 5, 2015. Retrieved October 3, 2015. ^ "Traditions". University of South Carolina Athletics. Archived from the original on July 16, 2007. Retrieved August 9, 2013. ^ "Lambeau Leap Statue unveiled" Archived January 2, 2015, at the Wayback Machine. Packers.com. ^ a b Sandomir, Richard (September 1, 2016). "Lambeau Field Gives Football the Old College Try". The New York Times. Retrieved September 2, 2016. ^ "Opening ouch: LSU sputters as Wisconsin lands historic upset". ESPN. ^ "Lambeau Field should host more concerts". Press Gazette Media. Retrieved May 1, 2017. ^ Kendra Meinert. "Ready to rock? Packers resist Lambeau reuse". USA Today. Retrieved April 18, 2017. ^ "Kenny Chesney and Jason Aldean at Lambeau Field". Retrieved May 1, 2017. ^ "Tickets on sale Friday for Billy Joel concert at Lambeau Field". Archived from the original on May 24, 2017. Retrieved May 1, 2017. ^ "Billy Joel gets an opening act at Lambeau". Press Gazette Media. Retrieved May 1, 2017. ^ "Paul McCartney to play Lambeau Field June 8". www.packers.com. Retrieved December 6, 2018. ^ "Lambeau Field Expansions". Green Bay Packers. 2015. Archived from the original on July 6, 2016. Retrieved November 18, 2015. 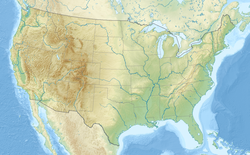 ^ "Green Bay Packers Launch Environmental Program". Archived from the original on October 24, 2015. Retrieved December 12, 2018. 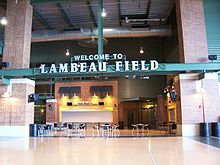 Wikimedia Commons has media related to Lambeau Field.